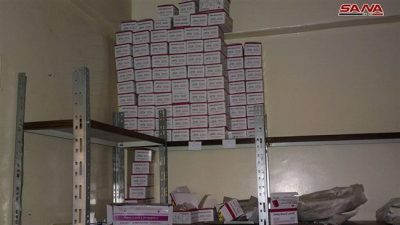 Syrian government forces have uncovered a considerable amount of Israeli-made medicine and medical supplies in a field hospital belonging to foreign-sponsored Takfiri militants in the country’s strategic southwestern province of Quneitra. Local sources, speaking on condition of anonymity, told Syria’s official news agency, SANA, that army soldiers made the discovery in the town of Naba al-Sakher on Monday as they were conducting a clean-up operation in the area to beef up security and stability and prepare repatriation of local residents. The sources added that the field hospital had several operating rooms, laboratory equipment and medical supplies in addition to a warehouse, where large quantities of Israeli- and Jordanian-made medicine were being kept. Takfiri militants in Naba al-Sakher had turned one of the town’s schools into a field hospital to treat their wounded comrades. This picture, provided by Syria’s official news agency SANA, shows a field hospital belonging to foreign-backed Takfiri militants, which Syrian government forces discovered in Naba al-Sakher town, southwestern Syria, on July 23, 2018. The development came only a few days after Syrian government forces and fighters from popular defense groups liberated nearly two dozen towns and villages in Quneitra Province. On May 21, the General Command of the Syrian Army and Armed Forces announced in a statement that complete security was restored to Damascus and its countryside after al-Hajar al-Aswad district and al-Yarmouk camp were totally purged of Daesh terrorists. The development was preceded by flushing the Takfiris out of the towns of Yalda, Babbila and Beit Sahem on the southern outskirts of Damascus. All images in this article are from SANA.